This title is directed primarily towards health care professionals outside of the United States. 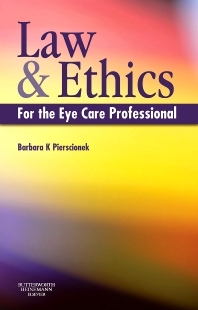 The author, a Professor of Optometry with qualifications in law and experience in ethics, has written a unique book that gives the practitioner and student a solid foundation in the ethics of eye care practice. All optometrists need to be able to show an appropriate professional attitude to patients and colleagues, and to display an awareness of the legal, ethical and commercial constraints within which optometry operates, including legislation relating to the use and supply of ophthalmic drugs. This book will help you achieve those objectives. Each chapter contains many examples, both real and hypothetical cases, and exercises based on situations in which optometrists and eye care practitioners may find themselves during routine practice. A key focus is on developing both the knowledge and the skills of the student and practitioner to deal with these situations. Comprehensive, practical and illustrated with lively cartoons, Ethics for the Eye Care Professional will be the first port of call for both students and practitioners looking for a grounding in the ethical issues applying to practice. Lively and accessibly written, with cartoon illustrations throughout. Introduction to ethics: what they are and what they are not; history of ethics in healthcare. The concept of professionalism: what it means to be a professional, obligations and expectations, development of professionals in health and eyecare. The professional Code of Ethics/Healthcare Ethics and ethical concepts. Beneficence and non-maleficence in eye care practice; requirements to keep abreast of new developments. Negligence (law): what constitutes negligence. Autonomy: respect for patients decisions/ duty to inform patients. Confidentiality/ Data Protection (legal). Equality and Justice; distributive healthcare. Collegiality; fair work practice; dealing with peers, colleagues, other professionals, non-professional employees. Business ethics: the ethics of running a practice, the ethics of competition; accountability. Ethical dilemmas. Ethical theory: deeper concepts: consequentialism, deontology, Kantian theory.